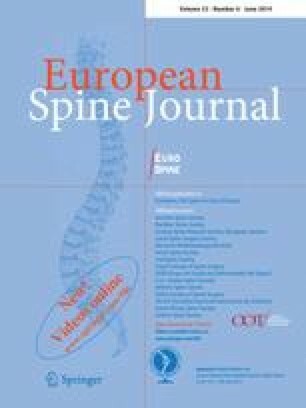 We are thankful to the Swiss Spine Society and the SWISSspine registry group who made this research possible by populating the database with their valuable and much appreciated entries. The Kyphoplasty group contributing data to the current study is comprised of the following surgeons (in order of case contribution): Michael Schüler (n = 44), Thomas Forster (n = 38), Gianluca Maestretti (n = 26), Urs Mueller (n = 23), Stefan Schären (n = 23), Max Aebi (n = 20), Markus Kröber (n = 19), Bruno Beele (n = 16), Ivan Broger (n = 16), Friedrich Sgier (n = 16), Martin Blay (n = 13), Ulrich Berlemann (n = 11), Thomas Lutz (n = 11), Christian Etter (n = 10), Christian Bärlocher (n = 8), Christoph Binkert (n = 8), Patrick Moulin (n = 7), Fabrice Külling (n = 6), Stefan Kunz (n = 5), Thomas Markwalder (n = 5), Uwe Schwarz (n = 5), Bijan Cheikh-Sarraf (n = 4), Bernhard Jeanneret (n = 4), Marc Morard (n = 4), Enrico Tessitore (n = 4)Oliver Hausmann (n = 3), Karen Heimberger (n = 3), Philip Otten (n = 3), Michael Payer (n = 3), Andreas Schirm (n = 3), Christof Hamburger (n = 2), Thomas M. Stoll (n = 2), Kristof Van Dommelen (n = 2), Martin Baur (n = 1), Michael Heinzelmann (n = 1), Knutti Oliver (n = 1), Rosa Martinez (n = 1), Aymen Ramadan (n = 1), Othmar Schwarzenbach (n = 1), Oliver Vernet (n = 1), Guido Wanner (n = 1). The authors, or any member of their family, did not have any conflict of interest or financial support related to the subject of this article.